According to a new survey by GfK Public Affairs for the Associated Press, we’re dumb. Really, really dumb. While most Americans understand that smoking causes cancer and that a mental illness affects the brain (real stumper, that one), only 53% are confident about childhood vaccines being safe and effective, 31% confidently accept evolution, and even fewer are confident about the age of the Earth and origin of the universe. There’s actually a striking contradiction on the list. While only 31% of adults accept human evolution, 65% of them accept microevolution (though not in name) in the sense that overusing antibiotics can lead to drug-resistant bacteria. But what is human evolution but a long series of microevolutions? 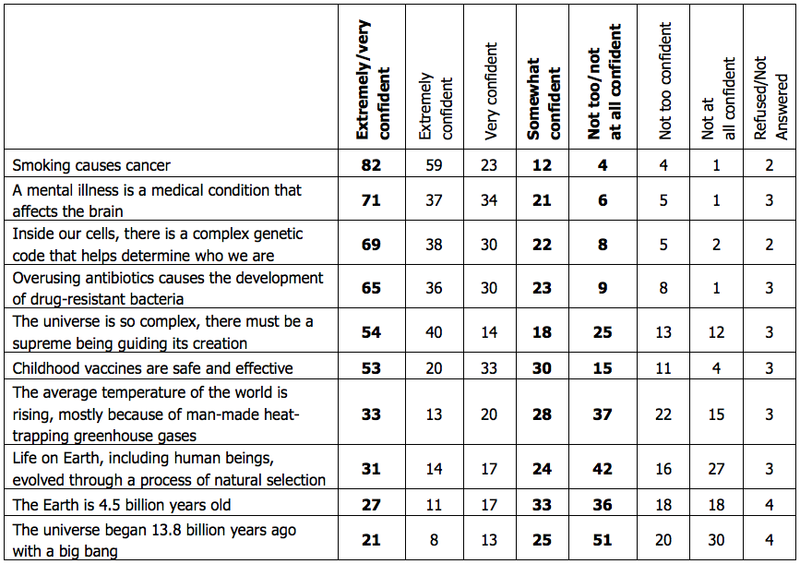 Confidence in evolution, the Big Bang, the age of the Earth and climate change decline sharply as faith in a supreme being rises, according to the poll. Likewise, those who regularly attend religious services or are evangelical Christians express much greater doubts about scientific concepts they may see as contradictory to their faith. From the standpoint of scientific literacy, it would be better if people didn’t believe in fairy tales. But from the standpoint of public health and a well-functioning society, we just need them to lay off the antibiotics. I’m pretty sure Saletan and I are of the same mind on these issues, but I don’t share his optimism. If so many people can have doubts about the age of the Earth or global warming — likely because religious/right-wing figureheads convince them that certain scientific truths are really part of some godless conspiracy — then the fact that they may be more likely to support, say, childhood vaccines is just hanging by a thread. What happens when evangelical pastors decide that vaccines or genetic testing are somehow anti-biblical and the next big threats to society? How many believers will change their minds on those issues? If they’re willing to suspend all critical thinking on something as scientifically solid as the origin of the universe, what’s stopping them from falling prey to other faith-based rumors? This survey only displays symptoms of a much larger problem: Ignorance is in play everywhere, but nowhere is it embraced like it is in some religious communities.